2001 Chung-Hwa Yi Wu "Jin Yeh Hao"
The spring is finally here! The weather is of typical April, in the morning rain falls like during monsoon and after lunch it’s sunny and warm out there. Two weeks ago with Xi Zhi Hao minibeengs shipment from HouDe I also received a sample of 2001 Chung-Hwa Yi Wu "Jin Yeh Hao". Today is the right time to try it. The tea is from Yi Wu area, it’s said to be counterpart of 2001 MengHai "Old Tree Tribute Cake - Jin Yeh Hao" using the same mao cha. 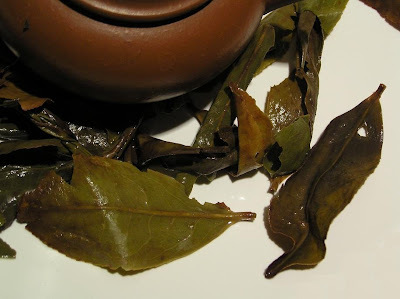 Guang wrote, that one half of the mao cha was pressed by Menghai, the rest by Meng La Tea Factory. My speculation is, that it’s for the high royalty fees Menghai asks. Similar thing (probably) happened with 2003 Menghai BuLang beeng, check the whole story here. The tea smells slightly aged with a touch of wet storage in the aroma of dry leaves. The sample I got shows nice leaf structure and stone-molded compactness. The liquor is clear and turns orange. Smell of the tea reminded me for old books, but the smell merrily turned into incense-like smell – exotic woods and aromatic spices. The taste followed the smell, sweet, slightly aged with a touch of acidity. After the fifth-sixth infusion the spicy, woody character of liquor gradually turned into sweet, plain fruity taste. This may be grim to those who are used to strong, harsh pu-erhs, but I like it for calm late night tea sessions. Especially when I want to sleep that night. This tea reminded me of 2004 Yan Ching Hao Yi Wu Cha Wang in means of taste and smell. This is what I believe is the typical Yi Wu mountain taste. The beeng is sold out for long time, but I believe I would buy one or two, if they are available. 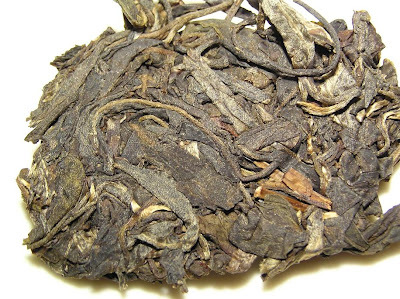 In next few days I will try to compare this tea to 2000 Yi Wu Zheng Shan sold by Scott – you will see why. Today was very warm and sunny out there, so I wanted to welcome the spring with adequate tea. 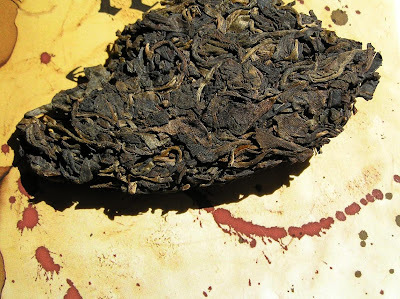 The one I decided to try is the 2007 Winter FengHuang WuDong Old Bush DanCong "Huang Jing" brought to us by HouDe. The leaves catch the eyes first. They are totally different from standard Dan Cong oolong – colorful, huge and strong. The reminded me the sight of autumn forest - some trees still green, some yellow, others red and brown. Ok, there weren't red leaves, but green, yellow and brown were there in all shades. Also the leaves were huge, so large that they didn’t fit my rather big yixing teapot. 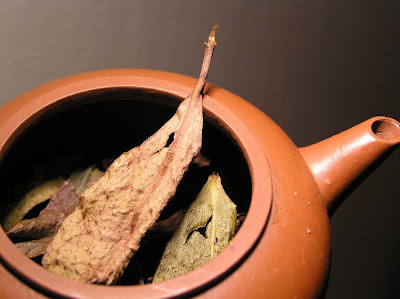 I had to soften the leaves with hot water of first infusion and only then I was able to cover the teapot with lid. The maker of this tea used mature leaves instead of young and fresh ones. Also, the leaves weren’t rolled into long stripes, so their overall look suggested heap of fallen fall leaves. I believe that the smell of Dan Cong teas is mostly better then the taste. But it's not just attribute of Dan Congs, many oolongs prove like that. This one smelled of grapes and raisins, very sweet but still fresh and with touch of spices. This was more powerful aroma than most of Dan Congs posses. Fortunately, the taste was very good, too – thick, long lasting, tickling the tongue and dancing in the throat. I have to admit that this Dan Cong is excellent – it’s different from other oolongs, but follows their footsteps in means of aroma and taste. Very good tea. 2007 Xi Zhi Hao "Din Jin Nu Er" Minibeeng Part I. Yesterday I tried the Yi Wu Cha Wang minibeeng produced by San Ho Tang Tea Factory. The tea was good, but the beeng was of poor quality. So I decided today to try a beeng, that looks much better than the last one. 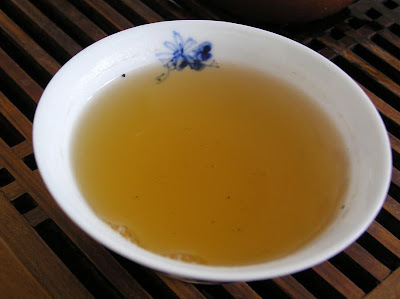 The Din Ji Nu Er minibeeng is said to be produced from spring raw leaves from the vicinity of ancient tea trees in Chien Jian Zhai. 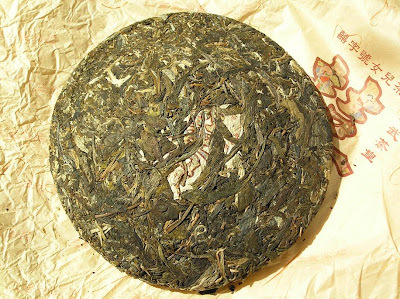 The beeng should be made from sun-dried mao cha by stone molding. Well, the beeng is very solid; it’s hard to believe that such compression can be obtained by stone molding. But from the slightly irregular shape and thickness I can assume, that this can be true. The beeng is nice, small and much thicker than an average cake is. It emits soft and young floral aroma. It looks much, much better than the Yi Wu one. On the other side, the Yi Wu minibeeng tasted very good, while this beeng performs much worse. First of all, the liquor – it’s just too orange. On wrapper is date of production – 2007 november 18th. 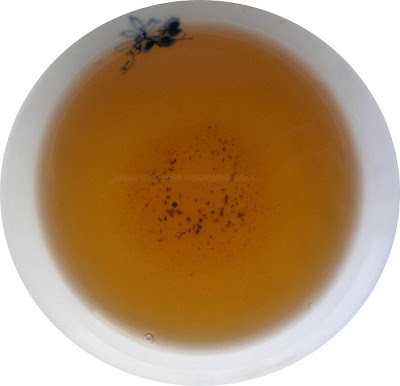 Such young pu-erh should be on some side of yellow, either bright or darker, but orange – that means problems. The second problem I found in this tea is the taste and smell. It wasn’t pu-erhish enough; it reminded me of Dian Hong teas. I was expecting many different tastes and aromas, but not this one. This aroma prevailed in the cup for all the eight infusions I made. Today I prepared the Din Ji in zhu-ni teapot, so I decided to try it next time in gaiwan. Maybe it will show me other flavors and more depth. I speculated that the strange red tea taste could be caused by over fermenting of mao cha. So I searched the wet leaves for reddish over fermented leaves. And yes, I found some of them. Not too much. What puzzled me more were small yellowish leaves. Check the picture – such different leaves cannot be from tea tree!! And the long yellow leaf wasn’t the only one I found. 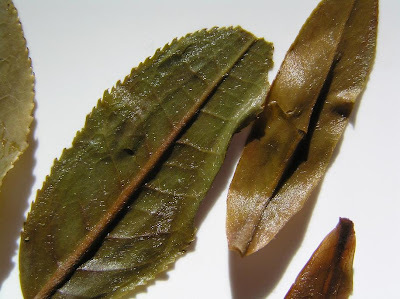 The real tea leaves (those with serrated edges) were thin like from over harvested trees. This beeng is said to be produced as birthday cake for Mr. Chen’s daughter. So I believe, they are intended to be for long term storage. Also, this fact implies me to believe, that they should be of better quality – hey, they are for his daughter! That’s why I’m so puzzled with the strange taste of the tea and the outlandish leaves. I will revisit this tea soon and post my thoughts here. Note: Tasting sets of all three of these minibeengs are available at HouDe. Hobbes will provide his reviews of these Xi Zhi Hao minibeengs in (hopefully) next few days, so check out his Half-dipper. 2007 Xi Zhi Hao "Yi Wu Cha Wang"
Yesterday I received the parcel from HouDeAsianArt with three new San Ho Tang beengs, the Yi Wu Cha Wang, Xue Shan Chuen Lu and Ding Jin Nu Er. Since I really like the Xi Zhi Hao brand I decided to try each of them. This is the first. Yi Wu Cha Wang, the Yi Wu Tea Emperor. First, here are few facts about the tea. 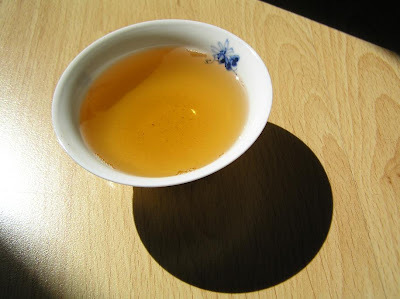 This is the fourth Yi Wu mountain tea made by Mr. Chen, previous were the test-run 1997 "Yi Wu Zheng Shan Wild Big-Tree", 2006 Spring Yi Wu Cha Wang and 2007 Spring Yi Wu Cha Wang. The beeng is Gu Hua, Fall Harvest and it is supposed to be made from the same mao cha, that was used to produce the 2006 (Autumn) and 2007 (Spring) Chen Guang-He Tang Yi Wu Cha Wang beengs – the mao cha is originally from the highest plantation area "Gua Feng Zhai (Howling Wind Village)" of Yi Wu. This may also mean, that the tea is single estate but not from wild trees. Why I decided to try the Yi Wu beeng first? Because I like the 2006 Chen Guang He Tang Yi Wu beeng a lot, even when I consider the negative critics around. The second reason was my extreme disappointed with this beeng. The San Ho Tang factory was always an expensive one, but the high price was compensated by the high quality of product. Even the “inferior” product line - the 2006 Ban Zhan beengs and the 2007 LongFeng (Dragon and Phoenix), 7542 and 8582 series - were nice made and used ok leaves. The higher or even premium beengs always displayed beautiful craftsmanship and top-quality mao cha. In real estates everyone knows the mantra “location, location, location”. And I believe that in pu-erh applies similar mantra – “mao cha, mao cha, mao cha”. The juicier and bolder the leaves are higher is the chance of good pu-erh. And you could understand my disappointment, when the worst beeng I ever saw was this premium-priced San Ho Tang. Please, click the picture to the top right and carefully examine it. You may notice, that most of the beeng consist not of leaves but of mao cha dust instead. It looks like it was made from the absolute bottom of mao cha sack, where only the most inferior and broken tea leaves rested. Please take special note to the third picture, you can clearly see how fragmented was the mao cha. By the way, if you check the picture of this beeng on Guang’s website, you may notice, that his beeng has the same problem. The bottom left side is OK, there are nice, big leaves, but the top right side is dusted in the same way than my beeng is. This tea is hydraulically compressed – that’s certainly not good for aging in dryer environments. Also, it’s pretty hard to break it to get the leaves needed to brew the tea. The smell of the beeng is very fresh, vegetal, and floral; you can feel how young it is. The tea brews light orange brew, thick and clear. It tastes like typical young Yi Wu tea – rich fruity sweetness and acidity, light floral touch, no smokiness. Actually, this tea tastes really good, I liked it a lot. I was surprised with the aftertaste, really powerful and filling the whole mouth. Actually, this tea is pretty nice. Tastes good, is strong enough – if I weren’t feel like cheated because of the dreadful mao cha, I would be devoted. I believe that it’s unwise to sell the “bottom of the sack” beengs to public; it caused a huge scar on my judgment of San Ho Tangs reputation. Well, I will be more cautious next time. Note: the review of other too Xi Zhi Hao minibeengs will be available here soon. Also, Hobbes will review these beengs in short time, so check his blog, too. Today I received a parcel from Yunnan Sourcing LLC. Not just it traveled 3 months instead of 10 days, but also it looks like some angry dwarf with big hammer knocked it out. Fortunately Scott packs his teas really carefully, so the teas were intact. 2006 Ming-Yuan Hao "Yi Wu - 858 Puerh Museum"
Even with the spring knocking on the door, it’s still dark outside when I come home. 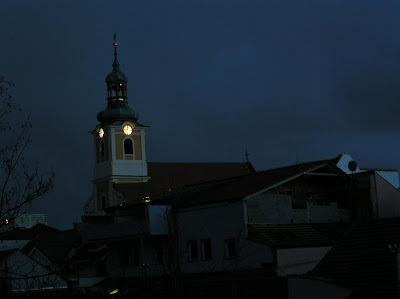 As I took photo of church outside my window, I noticed, that its clock isn’t adjusted. The weather was today sunny and warm, so I wanted to try some tasty tea today. So I ended up with sample of Yi Wu tea, that was produced by Ming Yuan Chung Guang Tea Factory with cooperation of 858 Da Yu Pu-erh Museum following traditional processing skills. The leaves of the sample are nice, still green and young with few yellow buds. Some of them are quite hairy. 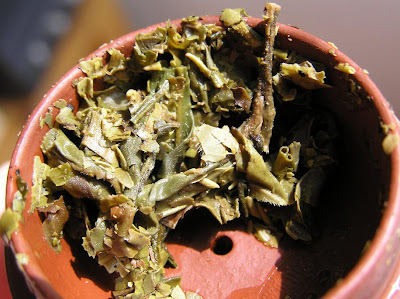 The sample included lots of stems – it’s a good sign, at least the good teas I drunk before were full of stems. I’m not sure; maybe they give power to the tea broth. The broth is dark orange, much darker then I could expect from less than two years old tea. One fact is important – I have this sample in airtight small plastic bag for about 4 months by now, so the tea can be affected/aged a bit more than a whole beeng would. When I washed the tea with boiling water, it gave up a bit metallic smell. Later I used about 95 Celsius (205F) water. The broth smelled a hint of tobacco (a rare smell, at least in my teas), little smoked with very gentle touch of apples. The taste was free of any smokiness; instead it was sweet with acidic ending, very fruity and refreshing. There was no mouth-drying effect at all. This tea is very pleasant to drink. If prepared properly you can serve it to guests that are not used to powerful and harsh taste of some of the pu-erhs. It’s more like a real pu-erh gentleman, with good manners and behavior. I already got one beeng from HouDe (thanks, Guang!) and maybe I will purchase some more to store. This tea was created from sun-dried and stone molded mao cha to pursue and re-produce the glory of 50's Hong Yi cakes and it behaves like that.